From the beginning, we believed in providing our customers with unique local handmade jewelry. 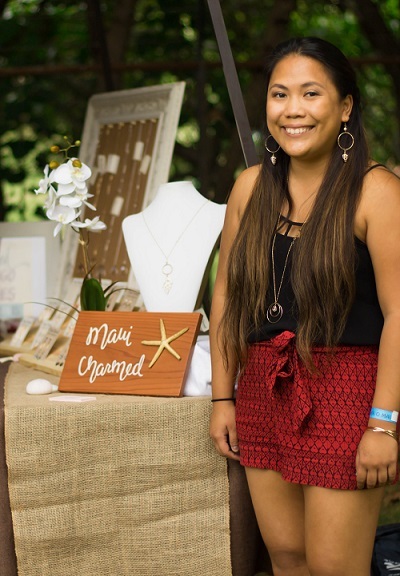 Maui Charmed takes pride in our approach to the handmade jewelry world. Our goal is not to mindlessly churn out large quantities of jewelry and rake in profits — our jewelry means more to us than that. We want to create jewelry that is unique; that when you wear it, you know it was made specifically by our hands. We want our customers to wear our jewelry with pride, knowing they are among only a few people in the world to own these items. There is a beauty to the handmade jewelry process that must be appreciated. Every single piece we create is unique, which is part of the reason our product is so special. From the hand woven dream catchers to the precision placement of pearls, corals, and shells on each product; all of these factors change slightly from each piece. We take pride in not selling mass-produced jewelry pieces. Handmade jewelry is a personal experience, and we devote our time and effort into creating each individual piece you purchase. As always, we thank you for your loyalty and support of our brand. We hope that you continue to follow us in our journey.